Movie studio production inspired decor is a spectacular idea in choosing decorations for a home theatre room, cinema, or props for a photo studio! Hollywood accessories and decorations make great props and are great for decorating a cinema, photo studio, pub, bar, restaurant, diner, or home theatre room! Film decor will create extraordinary charm, vitalize the ambience, and give the feeling of authenticity to any home theatre room or cinema! 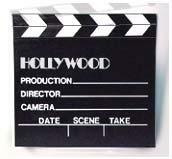 Make your decor extraordinary with a Clapboard, plastic and metal (movie) Film Reel, (movie) Film Can, Director's Megaphone, Director's Chair, Black and White Movie Stills, Color Movie Stills, Walk of Fame Coasters, Authentic Developed Film Strips, Studio Light Desk Lamp and your very own customizable Trophy! These items are also wonderful inexpensive photo props for photography studios! Immortalize your photo subject forever with a glamourous celebrity photo shoot! 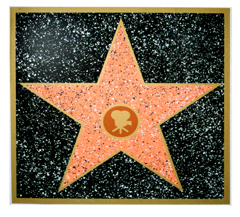 Capture the Hollywood glitz and glimmer of a shining star! 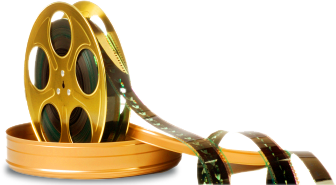 Film props and accessories also make distinctive and unique gifts and collectibles for movie enthusiasts and a new home! Film Strip Bows (For Decorations and Gift Boxes. Color and Random Industry Prints).